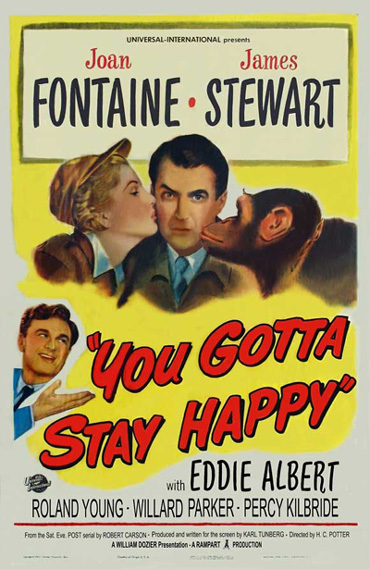 Jimmy Stewart: You Gotta Stay Happy (1948) – Did You See That One? In 1948 Jimmy Stewart got right back into the movie business with four films. One of those films is this quirky comedy You Gotta Stay Happy. The film stars Jimmy Stewart, Joan Fontaine, and Eddie Albert. Joan Fontaine had already won an Oscar for Suspicion in 1941 when this film was released. Eddie Albert was twice nominated for Academy Awards during his career. These nominations came from Roman Holiday and The Heartbreak Kid. This might also be the best known film directed by H.C. Potter who was coming to the end of his film career. After It’s A Wonderful Life Stewart was back in the mix in Hollywood. This was the beginning of a five decade run in movies that would bring us a host of memorable characters and films. 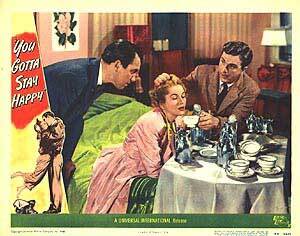 You Gotta Stay Happy is the story of an indecisive heiress named Dee Dee Dillwood (Fontaine) who finds herself unable to face her wedding night. In an act of desperation she flees her hotel room and her new husband for the room of an airline pilot named Marvin Payne (Stewart). After an awkward night she persuades him to take her to California. Along for the ride are a chimpanzee, a corpse, an absconding embezzler, and two newlyweds. With a crowd like that the possibilities seem endless. This is a fun film with some great comedic moments from Stewart and the rest of the cast. Fontaine is another one of the great Hollywood women that Stewart would find himself opposite on-screen. The film isn’t nearly as special as The Philadelphia Story but it has the elements of a classic romantic comedy. 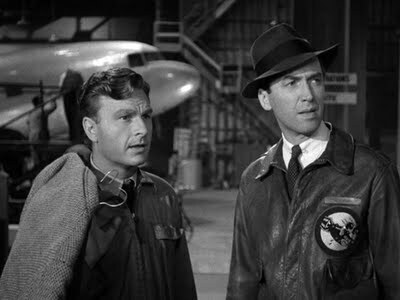 Jimmy Stewart had grown to love flying during the war and this film is an interesting choice since it recalled that experience. 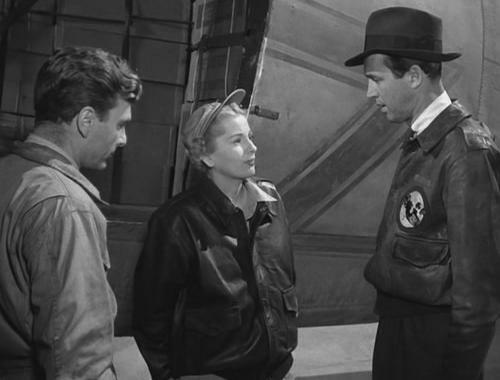 One interesting note: Jimmy Stewart dons a leather jacket for much of the film. It’s the same jacket he wore when he was flying mission during World War II. During 1948 Jimmy Stewart would act in a number of films that span genres and also his abilities as an actor. He would also find himself working, for the first time, with one of his greatest collaborators. Alfred Hitchcock and Stewart would combine to make some of the most memorable movies of both of their careers. Pingback: THE YEAR IN REVIEWS: 2011 | Did You See That One? Pingback: Jimmy Stewart: Magic Town (1947) | Did You See That One? Pingback: Suspicion – Did You See That One? Pingback: A Star Is Born (2018) – Did You See That One?